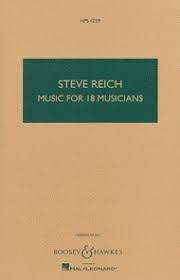 “Music for 18 Musicians” full score and parts are available from Boosey & Hawkes, but this is only the beginning of the story….. Most important to note is that “Music for 18 Musicians” should never have a conductor, nor any member of the ensemble with their back to the audience. This is the ultimate piece of chamber music where everyone is in charge at some point in the piece. The responsibility of “leader” is in constant flux. Apart from deciding who plays what, it is hugely important to know how to approach the piece and how to navigate your way round it. The piece is called “Music for 18 Musicians” because 18 is the smallest ensemble you can use to make it work – and this involves a considerable amount of instrument swapping (there are various options in this respect). 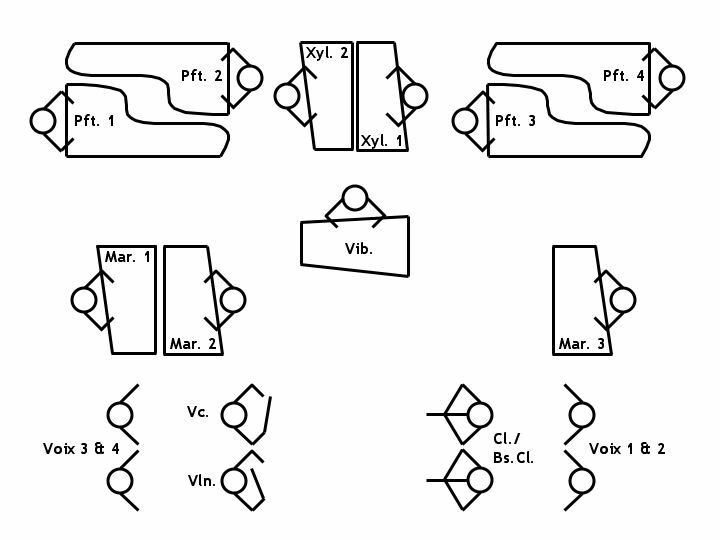 It is more straightforward with an extra percussionist (so 19 musicians), though this still presents several alternatives in respect of part allocations. Both score and individual parts for “Music for 18 Musicians” are modular and only really illustrate which notes to play in what order. There is so much more to playing this piece and so much more to understand that cannot be notated. Very recently Micaela worked with some students on their initial rehearsals in putting the piece together. After a couple of days, their professor said “I am so relieved that you came at this stage of the process, otherwise we would have approached this piece in entirely the wrong way!” – and this was a percussion teacher who had studied the score thoroughly. Apart from the practicalities, the approach, the pacing, the cueing, the articulation and the vocal microphone technique, musicians need to know how to listen to what’s going on around them. Then there is the extremely important matter of amplification – both onstage and for the audience. Micaela’s knowledge will be invaluable to your sound engineer, and she is always happy to sit at the sound desk during a performance to ensure that everything that needs to be heard is audible at any given moment. 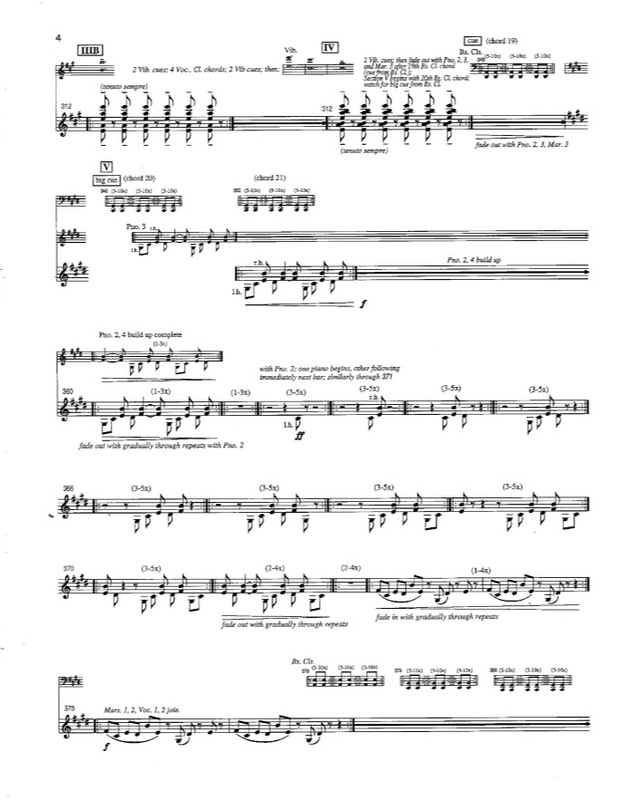 Taught directly by Steve Reich and by two of the original players who developed the piece (Bob Becker and Russ Hartenberger), Micaela sang in the first ensemble (Synergy Vocals and Ensemble Modern) to perform the piece using this new score in 1997. She has since sung the piece on countless occasions and coached ensembles both professional and student all over the world. In recent years, the only times Steve has joined an ensemble other than his own to play piano have been when Micaela has coached all the musicians in advance, and he readily admits that she knows the piece better than he does!